In 1976, the New York Public Library, whose holdings include cuneiform tablets, the illuminated Landevennec Gospels from the ninth century, Virginia Woolf’s diaries, and George Washington’s recipe for beer, printed its annual report on butcher paper. The report wasn’t a tongue-in-cheek attempt at the sort of conceptual art then making waves in SoHo. With New York City in financial collapse, the NYPL was facing drastic budget shortfalls and desperately needed to cut costs, even if it meant printing an important public document on the cheapest paper available or reducing hours at half of the system’s 83 branch libraries. 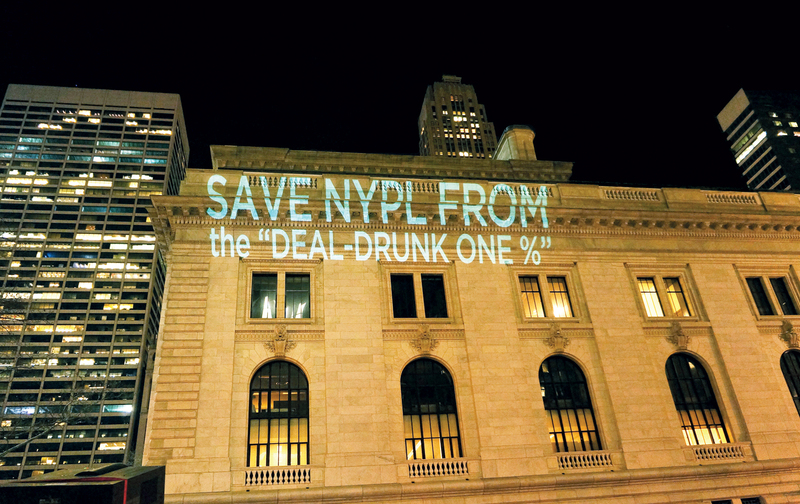 By the 2000s, the NYPL was cash-starved again, and its remedy this time was pure folly. As Nation contributing writer Scott Sherman explains in his lean and lively Patience and Fortitude: Power, Real Estate, and the Fight to Save a Public Library (Melville House; $24.95), portions of which first appeared in this magazine, the Central Library Plan, hatched in 2007, would have destroyed the NYPL in order to save it. The CLP aimed to consolidate three Midtown libraries into one circulating library inside the research library, which would undergo a $300 million renovation by the British starchitect Norman Foster. The Midtown libraries would be sold, bolstering the NYPL’s finances. But the cost would be severe: The seven floors of book stacks at 42nd Street would be torn out to make room for the new circulating library, and the 3 million displaced books would be stored off-site in Princeton, New Jersey. The 42nd Street branch was to be gutted of its research capacity, jeopardizing its mission as an intellectual oasis accessible to anyone and everyone. In classic Wall Street fashion, the CLP sought to maximize profit by minimizing services. In classic Wall Street fashion, the Central Library Plan sought to maximize profit by minimizing services. Looking back on the CLP controversy, David Remnick, the editor of The New Yorker and an NYPL trustee, told Sherman: “For me, the great thing lacking from the start was genuine public involvement, public discussion. A more democratic, noisy process.” There was certainly silence in the mid-2000s, when NYPL trustees were drawing up the CLP in secret, and again in 2010, when the plan was revived behind closed doors; but after Sherman unraveled the plan’s sordid details in December of the following year, other writers helped to bring on the noise. Michael Kimmelman, the architecture critic of The New York Times, demolished the CLP in a front-page article, warning that 42nd Street could become an “Alamo of engineering, architecture and finance.” (The Times would go on to publish more than 40 stories about the controversy.) The New York Post called the plan a “nightmare scenario,” noting that the library wanted to spend millions of dollars on a flawed renovation “because it says it needs money (go figure).” Robert B. Silvers, the editor of The New York Review of Books and, like Remnick, an NYPL trustee, published three pieces backing the CLP, but their author, Robert Darnton (also an NYPL trustee), came to acknowledge that the critics had good arguments and took them seriously. (The New Yorker was late to the story, not covering it until May 2014.) Along with the noise, there were alarums: Activist groups used sophisticated research and clever protests to create a worsening public-relations disaster for the library. After two and a half years of public clashes with critics, Marx and the trustees finally scrapped the CLP, having already squandered $18 million on it—“a staggering expenditure,” Sherman emphasizes, “for a library system that has difficulty keeping soap, toilet paper, and paper towels in the bathrooms” of its branches. Big money speaks loudly in New York City, but in the clash over the CLP, it was silenced by passionate idealism about words, ideas, and the public good. A pair of marble lions guards the Fifth Avenue entrance of the 42nd Street library; their names are the two virtues cited in the title of Patience and Fortitude. As the writer who not only exposed the CLP for the farce it was but doggedly followed the controversy over it for more than three years, Scott Sherman has earned a place in their company. His reporting and analysis have helped to protect the New York Public Library from its adversaries within.